This article was written and published in the early 1990s. At the time excision of diaphragmatic disease was routinely performed via laparotomy (a large incision, rather than via keyhole surgery). More than 20 years later, however, surgical techniques have progressed, and diaphragmatic disease is now routinely removed via laparoscopy and thoracoscopy. After reading the original article, take a look at Dr. Redwine's recent update (March, 2013). Endometriosis usually occurs in the pelvis, but rare cases have been reported in other areas around the body. It has even been reported to occur in males. Even if endometriosis exists far away from the pelvis, it still shares similarities with pelvic disease. When symptomatic endometriosis occurs elsewhere in the body, it usually draws attention to itself with pain. Like pelvic pain with endometriosis, the pain may be present all month long and may be aggravated during the menstrual flow or by movement of nearby structures. Paying attention to these generic similarities of endometriosis can help clinicians think of the diagnosis in different locations around the body, including the diaphragm. The diaphragm is a large, fairly thin muscle which looks like an overturned cereal bowl. It is only about one-quarter to one-eighth of an inch thick. It separates the chest cavity from the abdominal cavity and is attached around the bottom of the rib cage. There is a right half and a left half. The rear part of the right diaphragm is hidden behind the liver. The diaphragm is supplied by the phrenic nerve, and it is the most important muscle used in breathing. The diaphragm is of interest primarily to general surgeons, who are called upon to repair ruptures of the diaphragm resulting from trauma, or to repair hiatal hernias, among other things. Gynecologists are aware of the diaphragm, but since it can't get pregnant, they generally pay it no mind. However, endometriosis can occasionally affect the diaphragm, so gynecologists can't entirely ignore its existence. During my career I saw one of the largest series of patients with diaphragmatic endometriosis in the world. Each patient had a very similar history. All had undergone previous treatments for known pelvic endometriosis, but only one had received a diagnosis of diaphragmatic endometriosis at laparoscopy. There are several reasons for this. Most gynecologists have not been trained to look at the upper abdomen during a pelvic laparoscopy. After all, gynecologists are not trained to perform surgery in the upper abdomen or on the diaphragm, so it is somewhat understandable that many may not look where they can't treat. Additionally, in each patient, pelvic pain began earlier in life than did the pain related to the diaphragmatic disease, so the surgeon may have had no reason to suspect anything in the upper abdomen. Each patient reported the gradual onset (over the course of several months to several years) of right shoulder pain associated with the menstrual flow. The pain was described as coming from deep within the shoulder, and in some would seem to radiate from the right chest. The pain would spread down the upper right arm and up the right neck in some, the result of muscular tension reacting to pain. One patient described the pain as similar to the deep chest or shoulder pain one gets with running too hard. Several patients described difficulty sleeping in certain positions, being occasionally awakened by the pain. One patient couldn't sleep lying down because of severe pain and found partial relief only by sleeping upright in a chair with ice packs on her shoulder. Most of the patients eventually began to experience a low level of right shoulder pain throughout the month. Another patient had undergone several rounds of medical therapy directed at her diaphragmatic disease, including danazol and a GnRH agonist. 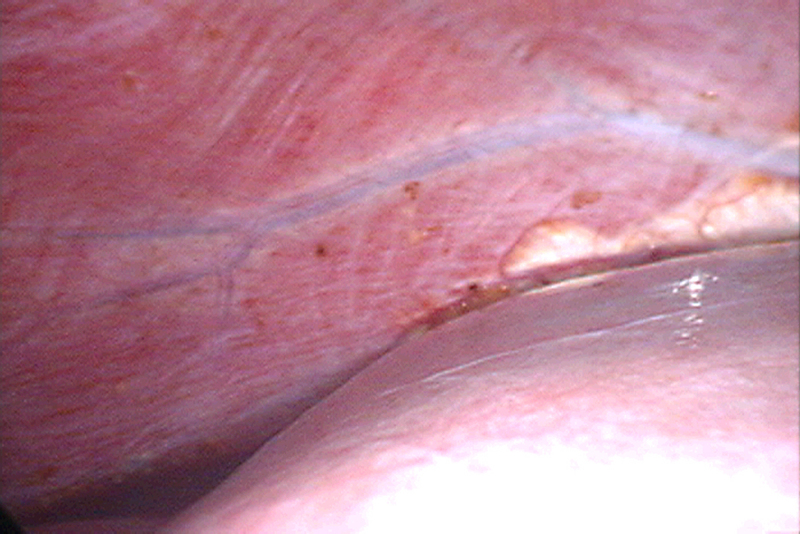 She had also had an attempt at laparoscopic fulguration of a lesion on the diaphragm, but still her pain continued. None of the others had received diagnosis or treatment of diaphragmatic endometriosis. Superficial lesion of diaphragmatic endometriosis. Invasive endometriosis of the right posterior diaphragm (behind the liver). Excision of invasive diaphragmatic endometriosis during laparotomy. The diaphragm following excision of full-thickness endometriosis. The ports required to fully inspect the diaphragm (including the right posterior diaphragm, behind the liver. The patient has been placed in a steep reverse Trendelenburg position (head above feet). In our first patient, we tried to resect the diseased area through the laparoscope, but this didn't work at all. The liver was in the way, and we couldn't get to it. Even if we had been able to resect this area, we would have run into a second problem: in each patient the endometriosis extended all the way through the diaphragm, so we would have had to remove a full-thickness portion of the diaphragm and repair it laparoscopically. This would have taken forever, and would have risked injury to the exposed lung. We had to open the first patient to complete her surgery, and we have had to open the other four also. At open surgery, the liver can be retracted out of the way, a portion of the diaphragm removed, and the diaphragm repaired securely with suture. All five patients seemed to have relief of right shoulder pain following surgery, and none has mentioned any difficulty breathing. Post-operative chest X-rays and fluoroscopy on our first two patients were normal, and we haven't felt compelled to check the others for this reason. Our first patient returned with endometriosis of the left diaphragm several months later (we were so focused on the right-sided nature of her chest pain that we didn't get a good look at the left diaphragm!). We have learned several things about diaphragmatic endometriosis from all of this. Suspect diaphragmatic endometriosis on the basis of right or left shoulder pain which may be associated with the menstrual flow. Use the laparoscope to look at both sides of the diaphragm as well as possible. Even if the surgeon sees a lesion of endometriosis he doesn't feel capable of removing at that time, at least the diagnosis will have been made. If a small diaphragmatic lesion is seen, it may just be a "sentinel" lesion which is only the edge of the iceberg. The main bulk of the disease may be hidden behind the liver and the correct diagnosis may require a second laparoscope inserted higher up in the abdomen. 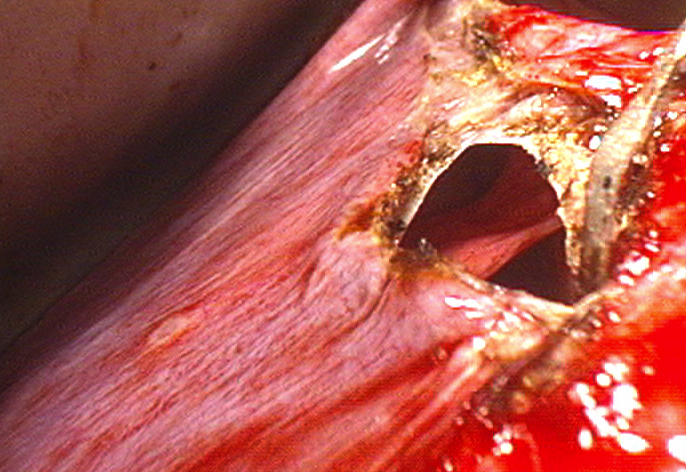 Laser vaporization or electrocoagulation of a small visible lesion may be treating only a fraction of the disease. Since disease which is symptomatic seems always to involve the full thickness of the diaphragm, it would be necessary to burn all the way through the diaphragm with laser or electrocoagulation in order to treat disease completely. This would risk damage to the lungs or heart, and the surgeon would still be left with a hole in the diaphragm which would need to be closed. 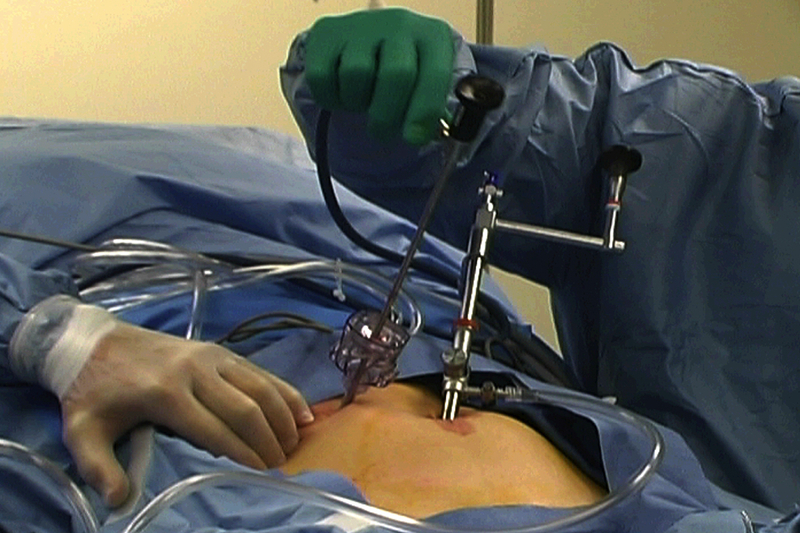 The laparoscope is inadequate for treating diaphragmatic endometriosis. A laparotomy is necessary. The above patient article was authored in the early 90s. Things have come on a little bit since then, so here is an update on the current status quo on the management of diaphragmatic endometriosis. 95% of cases occur on the right side due to embryonic patterning. The most common symptoms are right chest and shoulder pain which can radiate into the neck and down the arm. The pain first appears prior to and during menses, but in some patients it can spread out to involve the entire month, although still with a peri-menstrual aggravation. Some patients have to sleep sitting up and breathing can be painful when the pain is intense. Medical therapy is routinely a failure - no surprise. When diaphragmatic endometriosis is symptomatic, it has always penetrated through the full thickness of the diaphragm, which isn't difficult to do because the diaphragm is about 1/8 inch thick. Symptomatic endometriosis is always found along the rear margin of the diaphragm, where the edge of the liver joins with the diaphragm. This is an area which can't always be seen with a laparoscope inserted through the umbilicus, so it can be easily missed during surgery. 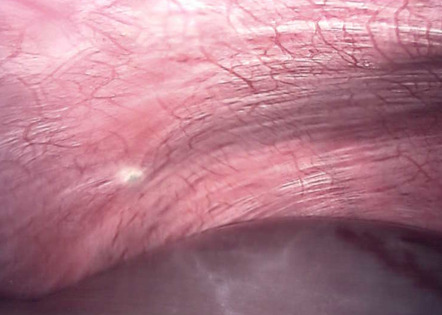 Another thing that can confound the diagnosis is that some patients with invasive disease of the posterior diaphragm can have smaller, superficial 'sentinel' lesions on the anterior diaphragm, which may be visible from the umbilical port site. The surgeon may think this represents all of the disease and may even excise these little areas thinking this is all that is present. When the patient continues to hurt, it confuses everyone. The best way to see the posterior diaphragm is to tilt the operating table so the feet are down (this allows the liver to fall away from the diaphragm a bit so the rear side can be seen more easily) and put a 5 mm laparoscope under the right rib margin so it can be passed over the liver and view the posterior diaphragm. 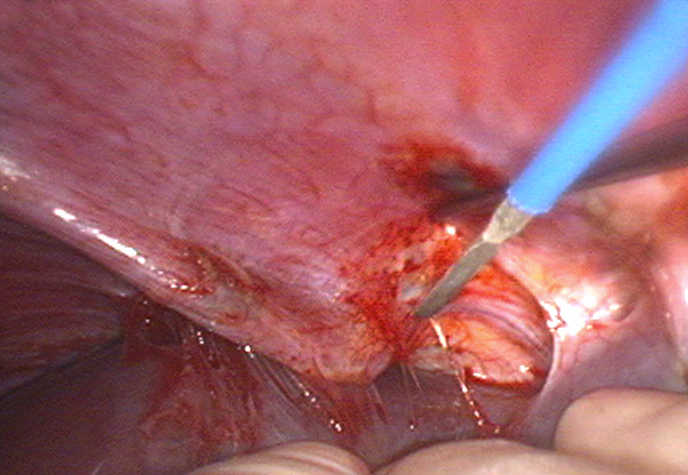 Resection of symptomatic diaphragmatic endometriosis always requires a full-thickness resection, which can be done by laparotomy or laparoscopy. The key for laparoscopy is to operate with the patient in the left lateral decubitus position, (laying her on her left side) since this allows gravity to pull the liver away from the diaphragm. Diaphragmatic function is normal in most patients after surgery, although an occasional patient may have reduced function for a few months until re-innervation occurs. This temporary reduced function is rarely noticeable by the patient, and given that these patients are incapacitated by one of the most basic bodily functions, it is a small price to pay indeed. Results of surgery are spectacular - complete relief of symptoms in over 90%, partial in others, failure in none. Partial relief may be related to formation of adhesions between the diaphragm and liver or to areas of full thickness penetration which occur further around the corner on the diaphragm beneath the body of the liver. This area can be viewed through the hole in the diaphragm before closure and endometriosis resected through the hole by operating in the thorax. A small chest drain is inserted to drain off fluid which may accumulate during healing, otherwise the patient may have a partial lung collapse due to the buildup of fluid and then has to go to radiology to have an interventional radiologist put a drain in.